The C3G Fund delivered a return of +2.3% for the month of July. The broader market was quite volatile and by month’s end the Small Industrials Index had retraced -0.5%. July 2018 marks the 4 year anniversary of the Cyan C3G Fund. Over that period, assuming the reinvestment of distributions, the Fund has delivered a total cumulative return of 137% after all fees, equating to 24% p.a. Over the same period the Small Industrials Accumulation Index has returned 48%, or 10% p.a, meaning the C3G Fund has outperformed the closest comparable index by an average of 14% per year. Since inception the Fund has been invested in a diversified portfolio of small and mid-sized ASX listed companies. We very much focus on delivering growth to our investors, but manage the downside risk and volatility with a conservative approach to portfolio construction and have, on average, held a cash balance exceeding 30%. The investment philosophy has remained unchanged and we have not, and will not, invest in Resources, Biotechnology or Property companies. To date we have enjoyed 35 up months and 13 down months. Our average return in our up months is +3.3%, with down months averaging -1.6%. AfterpayTouch (APT +52%): As one of our long term holdings, Afterpay has delivered fantastic returns based on its success in the Australian retail market. Management had also spoken of a move into the US retail industry, a market more than 20 times the size of Australia. The offshore service was launched in May and the company released an update in mid-July explaining that early traction was strong in the US and the Australian business continued to grow well, both online and in-store. Dean discussed Afterpay in an interview with Livewire Markets. Calix (CXL +66%): A recent IPO in which we invested, Calix raised capital to further develop its industrial processing business which produces mineral products for use in industries including wastewater treatment, aquaculture and crop protection. We conducted a site visit to their manufacturing operations in Bacchus Marsh prior to investing in mid-June. The company listed in mid-July and is currently trading at a ~60% premium to its issue price. Readcloud (RCL +21%): We took a position in this unique company at its IPO in February this year, and have increased our investment since. It has more than doubled in price but we believe its true underlying value is only beginning to be realised. RCL is positioning to lead the drive in digitization of the education sector for Australian secondary schools. The sector has been dominated by the book publishers’ delivery of printed material, but RCL now works with those publishers to deliver interactive digital content both directly to school and through its channel partners. It has already secured more than 70 schools with over 50,000 students on the system, with a strong growth pipeline to materialize in the next 12 months. PSC Insurance (+11%): This insurance services business has been a long term core holding of the Fund. It has recently made strategic investments and small acquisitions both domestically on offshore. We expect the group to deliver a solid result in the upcoming reporting season illustrating further earnings growth as a result of its expansion strategy and improved operating environment. Acrow Formwork (+10%): This emerging construction and civil services business is also beginning to lift its profile in the market as it positions to capitalise on government led infrastructure spending on Australia’s east coast. We expect the company to deliver short-term earnings growth and secure a new pipeline of contracts in its niche industry. Our investors will by now have received holding statements and distribution confirmations from our Fund administrators, Apex Fund Services. These will confirm that the C3G Fund paid an annual distribution totalling 9 cents per unit held. Investors will have nominated to either receive the distribution funds as cash, or reinvest the proceeds back into units in the Fund. This results in the unit price of the Fund being shown as “ex-distribution” as at 31 July 2018 (effectively 9 cents lower than it otherwise would be). Clients who elected to reinvest the distribution will now hold a higher number of units at the “lower” price. This is a similar process to a listed stock going “ex-dividend”. If investors require further clarity please do not hesitate to contact us. We continue to have compelling expectations for the companies in which we have invested your funds. 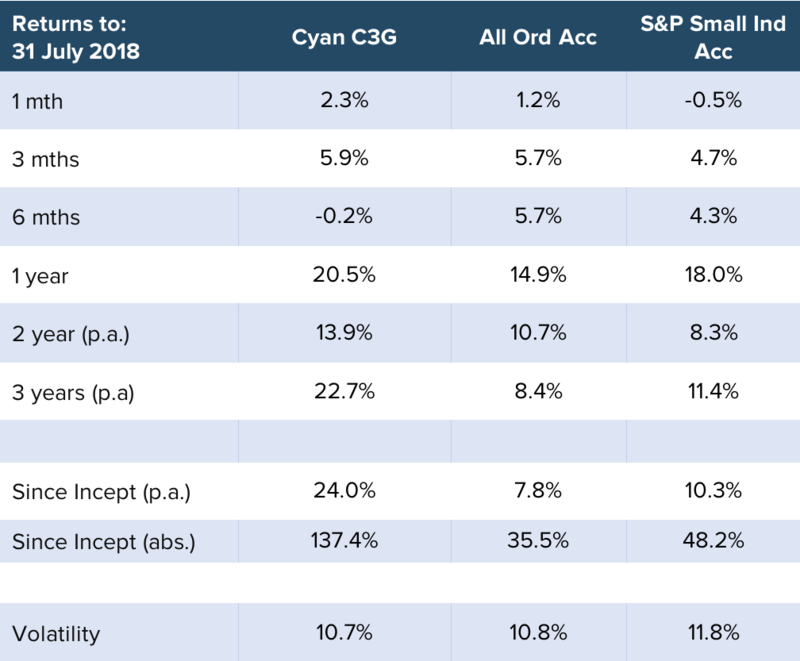 As a whole we believe these businesses to grow materially over the next year, with the first catalyst being the reporting of solid earnings results in the upcoming reporting season. We have a heavy schedule of upcoming company meetings (post results release) and look forward to reporting the performance of our investee companies and unearthing some new opportunities in the coming weeks. We thank all our investors for your support and look forward to keeping you all updated with the Fund’s progress. Hopefully in a further 4 years time we are reporting similar success.